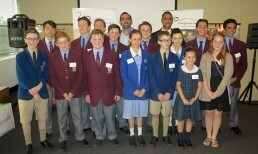 Sydney Swans champions Adam Goodes and Michael O’Loughlin joined students, board members and benefactors at the SCG on Thursday night for the annual GO Foundation function. At the event, hosted by John Mangos, six new students received GO Foundation scholarships from Adam and Michael while the class of 2015 was congratulated for their efforts this year. The event was a huge success with some notable attendees including Swans Chairman Andrew Pridham, AFL Commissioner Sam Mostyn, renowned author and SMH columnist Peter FitzSimmons among others. One of the highlights of the evening was the heartfelt message to students from Shelley Reys, former co-chairman of Reconciliation Australia and former vice-chairman of the National Australia Day Council, who encouraged all to follow their dreams and be whoever or whatever they want to be. Established in 2009, the GO Foundation, in partnership with the Australian Indigenous Education Foundation, exists to provide Indigenous children with scholarships to attend quality schools. Goodes expressed a special thank you to the Foundation’s many supporters and donors whose generosity will see even more students joining the current 17 scholarship holders in the future. “The GO Foundation is our way to give back to those people who sacrificed their time and effort and really welcomed us into the community here in New South Wales (after we got drafted to the Swans),” Goodes said at Thursday’s function. “This is our way of giving back, helping local kids in Sydney get an education because we know how important it is to support these young minds. Goodes’ thoughts were echoed by O’Loughlin. “The GO Foundation is an extension of what Adam and I have always done, ever since we came to the Swans and we became involved in communities and schools,” O’Loughlin said. “It’s been a huge passion for us to be able to help people – we’ve had a lot of help over our journey to play AFL football. “It’s been an amazing experience for us … and more kids going to school, finishing school and going on to be leaders not just in sport but in the corporate world is what’s really important.